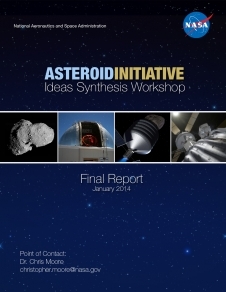 This report summarizes the discussions and recommendations that emerged from the Asteroid Initiative Ideas Synthesis Workshop. In 2013, NASA kicked off the Asteroid Redirect Mission and the Asteroid Grand Challenge, collectively known as the Asteroid Initiative. On June 18, we issued a Request for Information to seek innovative ideas that could help NASA refine the objectives of the Asteroid Initiative and initial ARM concepts, to explore alternative mission concepts, and to broaden participation in the mission and planetary defense. Those ides were discussed at a fall 2013 workshop. Today, NASA posted the final report summarizing the workshop discussion and recommendations. An unprecedented response followed the release of the RFI: the agency received 402 responses, 40 percent of which were from individuals and members of the general public. All the ideas were evaluated and rated. 96 of the ideas were chosen to explore in greater depth at the Asteroid Initiative Workshop, held in two parts at the Lunar and Planetary Institute in Houston, Texas. The first part took place on September 30 before the government shutdown, with 150 people attended in person. The workshop resumed on November 20-22, and approximately 120 people returned. Over 2,000 people were able to participate virtually. The purpose of the workshop was to further examine and foster a broad discussion of the most promising ideas gathered via the RFI, and to identify and synthesize ideas that could help refine the concept to find, capture and redirect, and explore an asteroid and generate new ideas for planetary defense. The workshop participants also made recommendations for further studies and next steps. We are already acting on the ideas submitted through the RFI process. The NEOWISE spacecraft was reactivated in September 2013 to search for near-Earth asteroids that could be potential targets for the ARM. Other recommendations from the workshop include holding additional forums to engage citizens in the asteroid initiative, and creating incentive prizes for milestones in both the mission and grand challenge. NASA’s Asteroid Initiative consists of two separate but related activities: the Asteroid Redirect Mission and the Asteroid Grand Challenge. NASA is developing concepts for the mission, which would use a robotic spacecraft to capture a small near-Earth asteroid (7 to 10 meters), or remove a boulder (1 to 10 meters) from the surface of a larger asteroid, and redirect it into a stable orbit around the moon. Astronauts launched aboard the Orion crew capsule and Space Launch System rocket would rendezvous with the captured asteroid material in lunar orbit, and collect samples for return to Earth. The grand challenge is seeking the best ideas to find all asteroid threats to human populations, and to accelerate the work that NASA is already doing for planetary defense. The Asteroid Initiative will leverage and integrate NASA’s activities in human exploration, space technology, and space science to advance the technologies and capabilities needed for future human and robotic exploration, to enable the first human mission to interact with asteroid material, and to accelerate efforts to detect, track, characterize, and mitigate the threat of potentially hazardous asteroids. This image of a patch of sky in the constellation Pisces is among the first taken by the revived NEOWISE spacecraft's infrared cameras, and shows the ultimate target: asteroids. Appearing as a string of red dots, an asteroid can be seen in a series of exposures captured by the spacecraft. The rocky body belongs to our solar system's main belt, a band of asteroids that orbits between Mars and Jupiter. NEOWISE is on the lookout for both main belt asteroids such as these, and especially for near-Earth objects (NEOs), which include asteroids and comets that pass relatively close to Earth. The asteroid is called Holda, or 872, and was discovered in 1917. 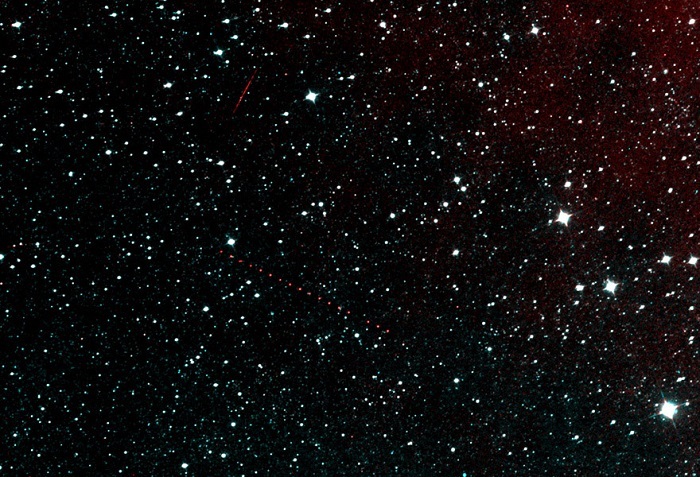 The faint red streak in the image is an Earth-orbiting satellite passing above the NEOWISE spacecraft. NEOWISE originated as a mission called WISE, which was put into hibernation in 2011 upon completing its goal of surveying the entire sky in infrared light. WISE cataloged three quarters of a billion objects, including asteroids, stars and galaxies. In August 2013, NASA decided to reinstate the spacecraft on a mission to find and characterize more asteroids.